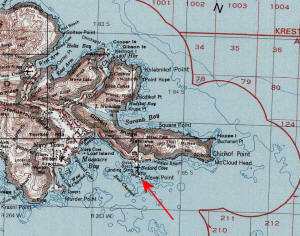 Location: On Attu Island in Massacre Valley near Engineer Hill. Facilities: This ski hill was next to Camp Earle, a large military "city" that was home to many thousands of US Army and US Air Force servicemen. This "little city on the edge of the world" had hospitals, pubs, bowling halls, a church and a movie theatre. Miscellaneous: Attu Island was the site of a brutal 20 day battle in 1943 as the US fought the Japanese to regain control of this island. 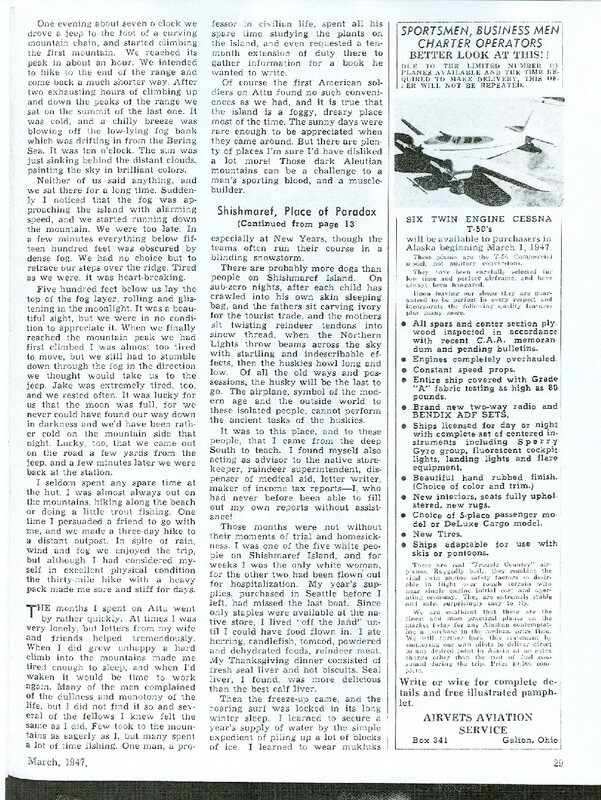 An account of this WWII battle can be found below. 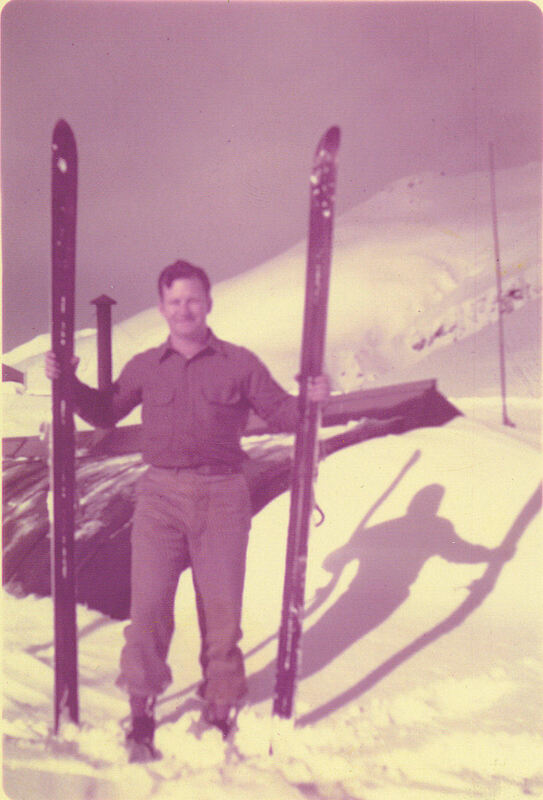 Be sure to read Bob French's excellent account below of skiing on Attu Island in the 1980's, and finding the remains of the Attu Ski Hill rope tow. 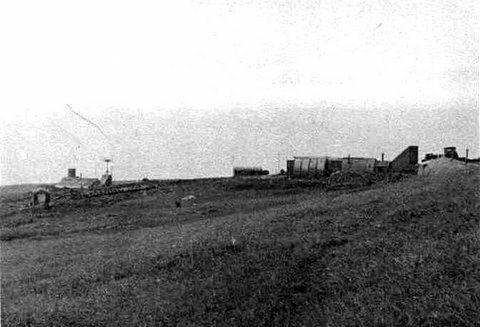 This rope tow was built during Word War II, after the Battle of Attu, for ski troop training and recreation. Photos: Does anyone have old pictures of skiing at the Attu Ski Hill (or current pictures of the vicinity) that they would like to contribute to ALSAP ? 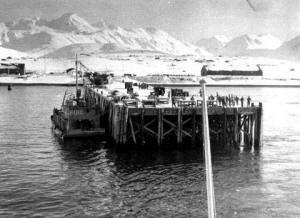 I arrived on Attu in November of 1944, as a replacement. I was a radar repairman and ran a seacoast surveillance radar station on Cape Klebnikoff for about a year. 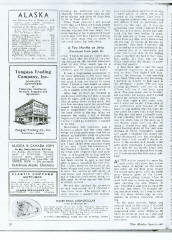 We were supplied by LCT at Keliher Beach and walked to Chichigof Harbor for a bath every two weeks. Then I was sent to Massacre Bay to serve as operations sergeant for the Post Engineer. At that time we skied using the rope tow and I must admit my memory is somewhat hazy as to what went on there. I have attached a picture - the only one I have of the top of the tow. Of the two guys in the center of the picture, I'm the one on the left. The fellow facing me was too eager to try out skiing and wouldn't wait for instruction. He went about 100 yards down the hill, got "caught" in the deep, heavy corn snow, and broke his leg. That put a damper on the enthusiasm for skiing for quite a while. As you can see in the picture, we were splicing the rope to shorten it. I am sending you a bunch more [pix] by separate email, primarily for your own enjoyment. 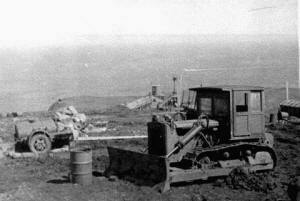 Most of them are pix of the Coast Artillery Bn radar site on the north side of Attu. There was another (SCR582) radar set on the south side on the east end of Massacre Bay. I can't remember the name of the location but it was out in the direction of Alexai Point. 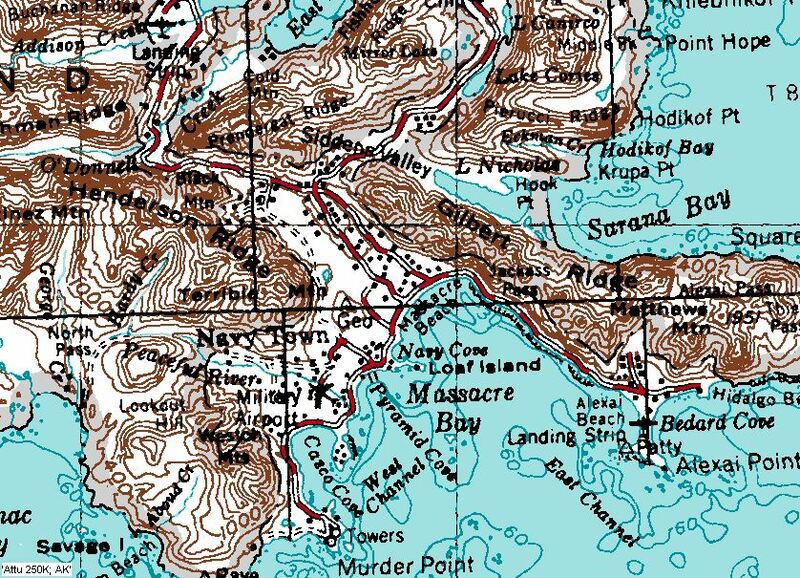 When we drove to AK in 1996 we took a boat trip from Seward* to visit the glaciers and were told by a Park Ranger that there had beeen another identical station near there. I think they only made a half dozen of those sets, which was 6 too many. Very primitive microwave technology that barely worked. *On that trip we drove every highway in Alaska except from Fairbanks to Pt. Barrow. Now that they are going to do some more drilling up there, I'm sorry we missed it. By strange coincidence I went to Japan on business (cameras) in 1958, by DC7C, which couldn't make it non-stop so we landed on Shemya, 18 miles from Attu. I never expected to see that part of the world again. During the next 10 years I landed in Anchorage many times, until they built jets that could make it from SFO without refueling. When I was sent to the outpost we were issued skis and snowshoes, but eventually we gave up on them. It was easier to walk on the windpacked snow, even though you occasionally sunk in and lost your stride. I don't know what more nostalgia an old man can impart but if you have any questions, holler and I'll try to give you an answer. 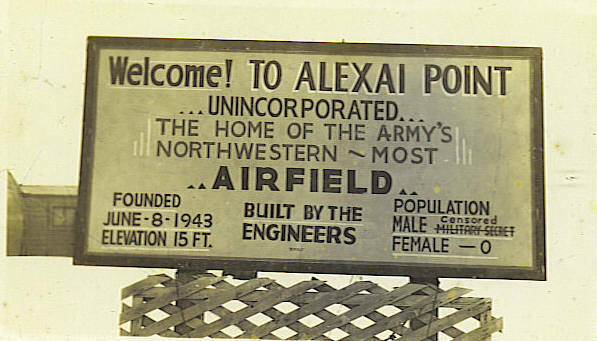 Ron Pyron's father, Norval R. "Pony" Pyron, was stationed at Alexai Point on Attu Island from August 1945 to March 1946. 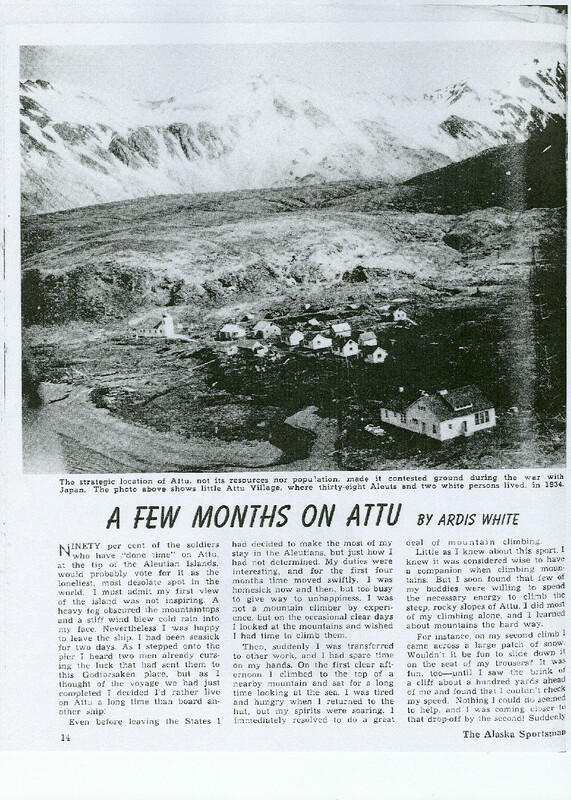 "A Few Months on Attu"
The article below is a well written account of skiing and climbing on Attu in 1946-1947. Whittier Alaska has a small museum with some very nice Alaskan military history displays The museum has this display of the Japanese invasion of Attu. Note the skis on the right of the display. 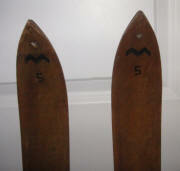 Presumably these were Japanese skis found at Attu. You will find this picture there and the picture of another Japanese skier that is shown lower on this web page. 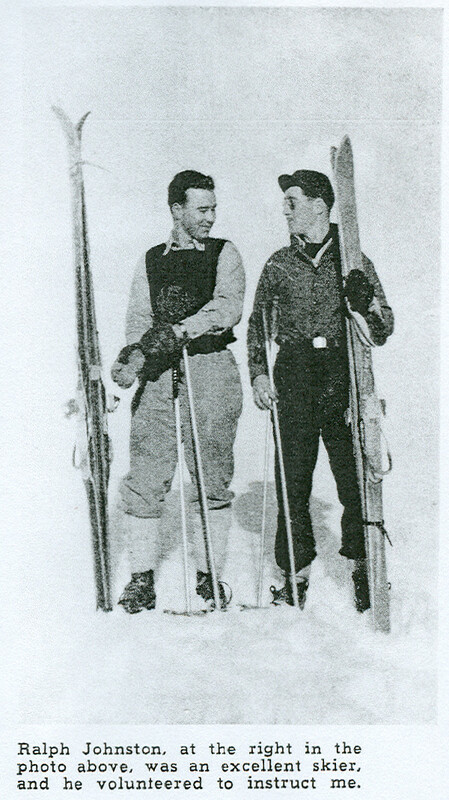 The skier to the left is the young man on top. All of these Japanese soldiers likely died at Attu shortly after this picture was taken. 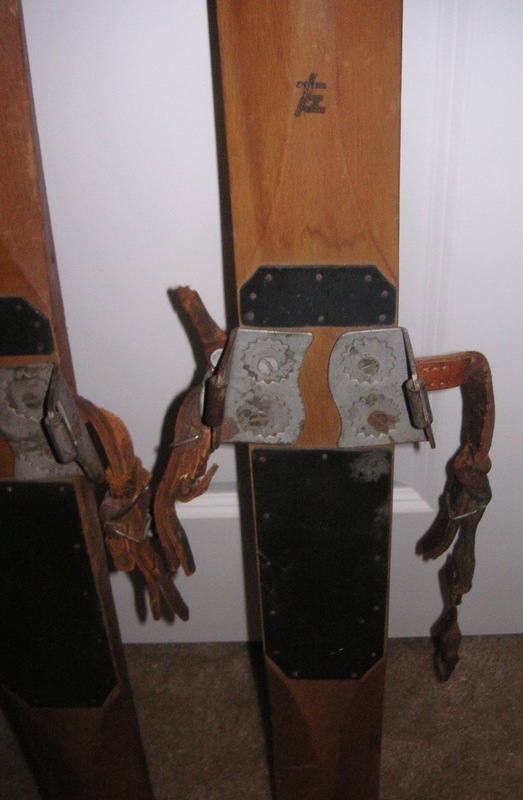 A closer view of the skis ... and the bindings. The skis are numbered at the tip. The Japanese symbol on this ski is "migi", meaning "right". This ski's mate likely had the "hidari"/"left" symbol. 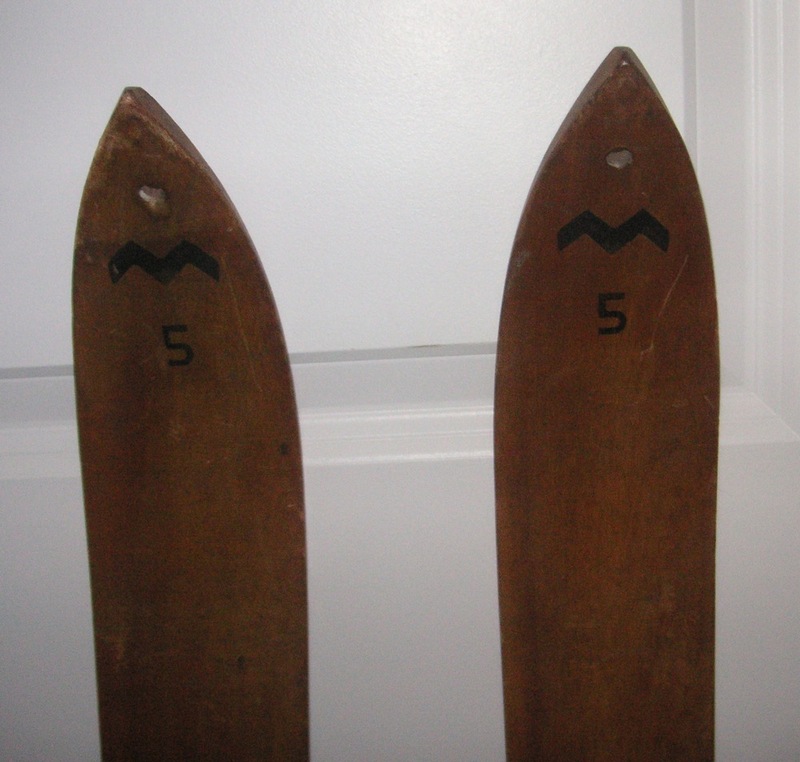 It is interesting that these skis are also marked with the letters 'ELFA'. Can anyone offer an explanation of the "ELFA" insignia? The verso on this US Navy picture reads: "A warm fire on Attu's chilly beach serves a double purpose. 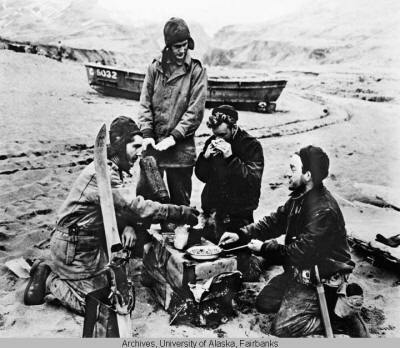 It cooks a hot meal and thaws out the hands of these U.S. sailors at the Holtz Bay area of Attu Island, following the landing there to drive out or destroy the Japanese garrison. Even in May that cold-weather made those skis (foreground) come in handy in the Aleutians." Note that the ski in this picture looks exactly like the Japanese skis in the Whittier Alaska Museum pictures above. 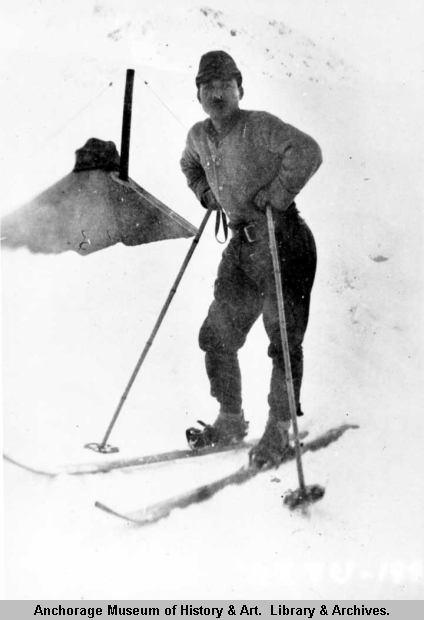 This Japanese soldier on skis was one of the reasons Americans came to Attu. In 1943 US military forces fought and defeated the Japanese for control of Attu Island. 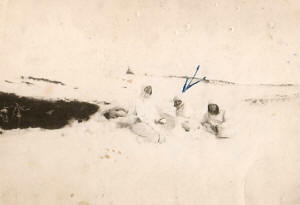 This picture was found in a Japanese military encampment on Attu after the battle. Chances are good that this Japanese skier never shared the Attu rope tow with US skiers. He likely either died fighting the US Army, or killed himself to avoid capture. 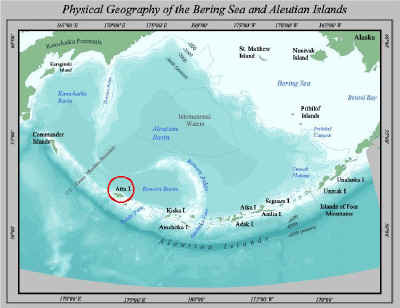 This map shows the location of Attu Island on Alaska's Aleutian Island chain. It's about as far west as you can get in the US. 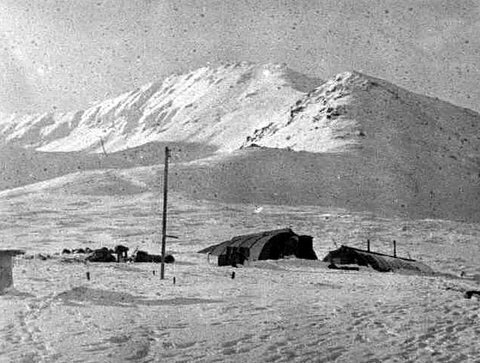 The Attu Ski Hill takes the honor of the westernmost lost ski area in the U.S.A. 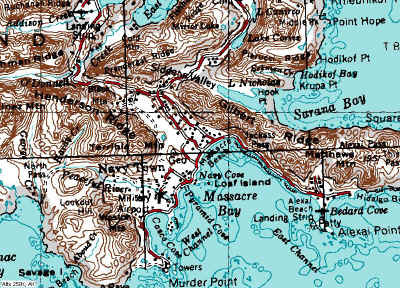 This topo shows the location of Massacre Bay/ Massacre Beach on the east side of Attu Island. The Attu Ski Hill was located up the valley to the northwest. The exact location of the Attu Ski Hill is still being researched. I was fortunate enough to spend about 9 months out of 20 at Attu from 1984 to 1986. I was an inspector for the reconstruction of the USCG Loran Station Attu, and was on a 2 or 4 week out, 2-week back schedule. I only had Sundays off and tried to do some bigger explorations on those days. However, I was able to do a fair amount of telemark skiing during the afternoons and evenings. Attu is so far west, but is only 1 hour off from Anchorage time, so "solar noon" is about 2:30 pm, so even in the winter, there was daylight past 6 or 7 pm. The Aleutian Islands are hardly what one thinks of when we think of great skiing sites. Yet, I experienced many days of spring skiing conditions that were typical throughout the year. The snow extended down to the water's edge, and because they had only 2-4 feet of tides, you could ski right along the breaking waves. The typical horizontal rain/sleet/snow mixture that Attu gets had one major advantage. The winds groom the slopes by filling in gullies, even the big 30 to 40 foot deep gullies. The rain kept the snow compacted, and the warmth kept it in spring, corn snow for most of the year! 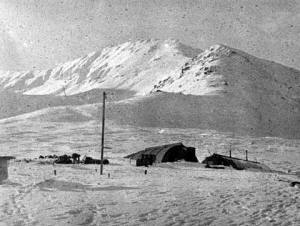 Attu is very mountainous, and the skiing was only limited by my ability, and how much time I had off. There were ski-able hills in 3 directions; the 4th had the North Pacific. 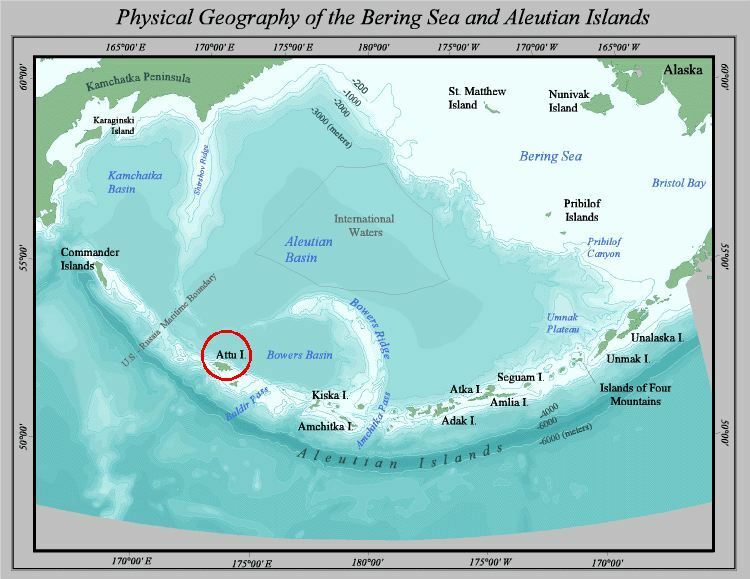 Few Alaskan's know that there were 40,000 soldiers on Attu after the island was re-taken from the Japanese. The rolling tundra is covered with remnants of the different "villages", serving the bomber base, fighter plane base, and submarine base. Most of the bigger buildings had been burned down a few years before I got there, (the excuse was that they were rotting and in danger of falling down.) however, there were still plenty of old Quonset huts in varying stages of disrepair, and many still had old pin- up's on the walls. It was not uncommon to be going along through what appeared to be wilderness, and come upon a fire hydrant surrounded by acres of tundra! 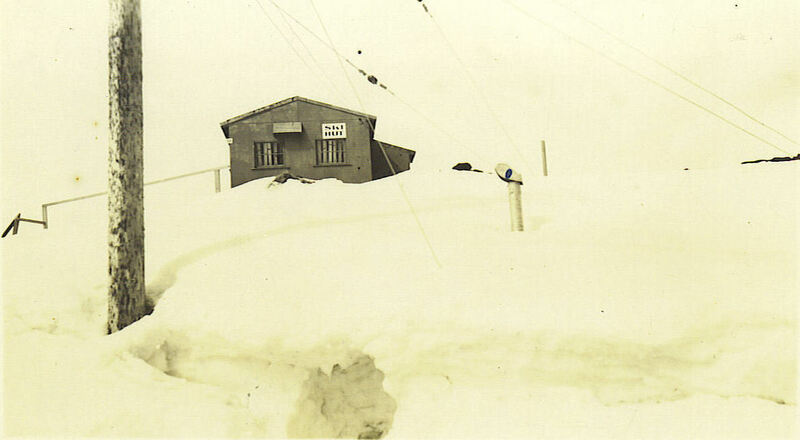 Some of the only features that stuck out of the snow were thousands of telephone and power poles. Most had lost their wires and cross beams years ago, and I was not surprised that there was a line of telephone poles that went up one of my favorite skiing hills, although I couldn't see any remnants of a building that they would have served at the top. 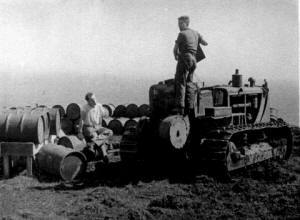 It wasn't till the following summer that I discovered that the "telephone poles'" were actually part of a rope tow! I found several of the automobile rims that were used for rope guides and the gearbox drive for the rope. I don't remember what the name of the hill was, but it was probably 600 -800 feet high and had mostly intermediate slopes, but was steeper towards the top. There were no trails, as there were no trees to deal with, the runs were just limited by gravity and how far you wanted to hike, it was just part of the lower foothills of the mountains. 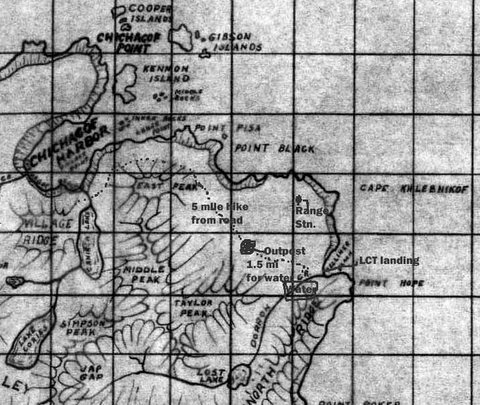 It might be marked on some of the older maps. It was in Massacre Valley, on the way towards Engineer Hill. 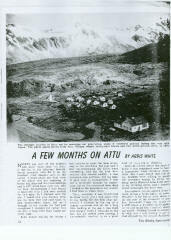 Attu was re-taken in June 1943 and was mostly disserted by 1949, so the longest that it could have been in business for Alpine skiing as 5 or 6 years. I don't know of any resources to find out more information about the lift, some of the military historians may be able to help. Certainly the military has put many ski lifts in the name of training, as well as morale and recreation. 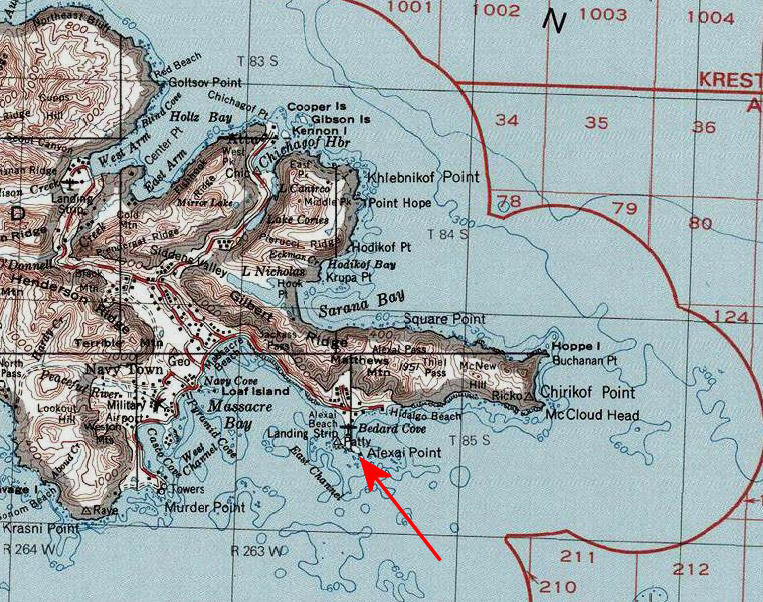 I was the only person telemarking on Attu at that time, and I have no idea whether or not anyone has been doing it since. 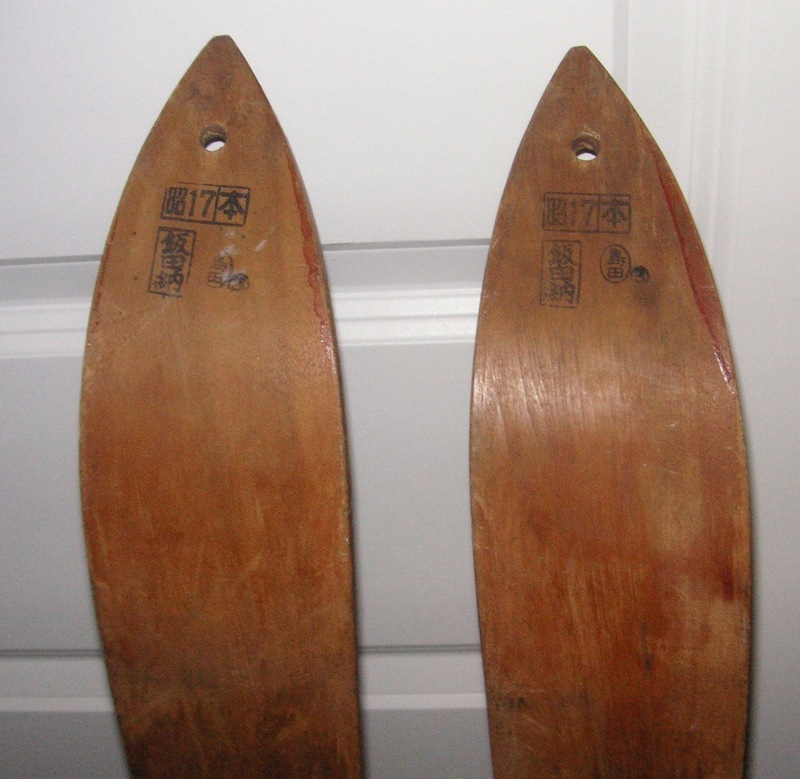 I did negotiate with AMH to buy six pairs of fishscale touring skis, and bought a pile of used three pin boots for the Coasties to use. There were a few of them who would take them out, but couldn't keep up with my skins and Fischer 99's. I will try to find the photos that I took. I know that I have some of the wheels in the summer time, and I might have some winter shots too. Some other fond memories of skiing at Attu. Finding a nesting pair of Whooper Swans at a small lake near the station. Seeing White Tailed Eagles soaring along with the ravens. Falling down on Artillery Hill early in the season and finding a jagged exploded shell casing exposed by the sitz-mark that I made, yet not a scratch on me. 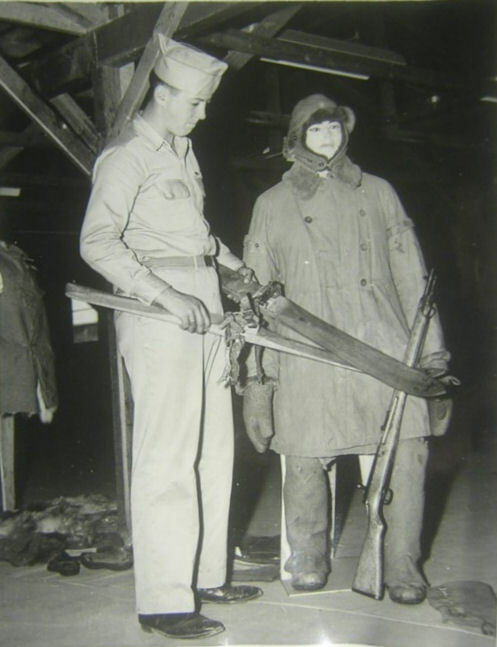 Digging a pit to wait out a snow squall on a day that brought 3 squalls interspersed with brilliant sun on an all-day tour over a pass to an adjacent bay to visit a P-38 that now sits outside Hangar 1 at Elmendorf AFB. Skiing one evening where the winds were gusting to over 95 mph. The bigger gusts would knock me down, and it was a tough slog to go downhill to the station on my way back. Watching the ravens play in the wild winds that are a constant fact of life out at the end of the world. Submitted by Bob French, Nov 2004. 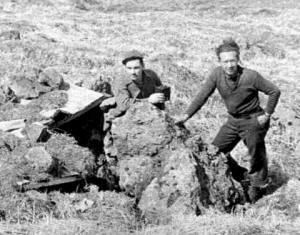 In early June of 1942, Japanese forces landed on the island of Attu capturing the only inhabitants: 41 native Attuans, an American schoolteacher and his wife. When American troops landed almost a year later, May 11th, 1943, they found the Japanese dug in and well positioned in the foothills and ridges that cover the Southeastern portion of the island. 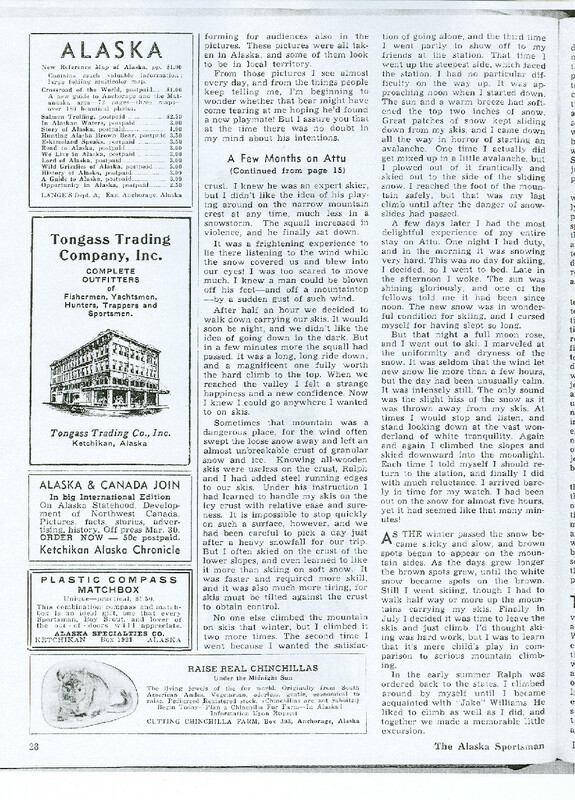 The American's also found that they were not completely prepared for all the trappings the weather and topography of Attu had in store for them. 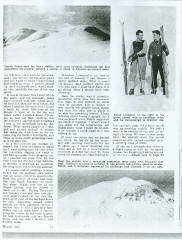 Trained in warm climates and outfitted with inadequate cold weather gear, many succumbed to frostbite and hypothermia. The cold Bering Sea also served as an unwelcome adversary, claiming several soldiers before they could get ashore. Low lying fog impeded the American's ability to see and navigate the many reefs that surround the island. 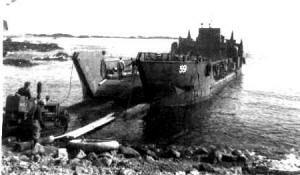 Landing craft would run into each other or rip-up altogether on the reefs, sinking with everyone onboard. When land was finally reached, the American forces found that the tundra could not support the weight of the vehicles and artillery. It would be up to the foot soldier to take the island back. The Japanese were buried in the hills. They wore white to blend in with the terrain, and would rise and fall with the level of the fog line. The Japanese soldiers used mortars, hand grenades, and snipers to attack the American forces as they advanced up Massacre Valley. The battleships Nevada, Idaho, and the Pennsylvania used their guns to bombard the island with shells. As the battleships hit their targets, Japanese machinery, soldiers and supplies came down the mountains along with the snow which moments earlier had fortified them. A second American force came from the north, but took longer to reach its destination then first thought. The unexpected delay caused the American troops to run out of supplies, forcing them to search the dead bodies of Japanese soldiers for rice. 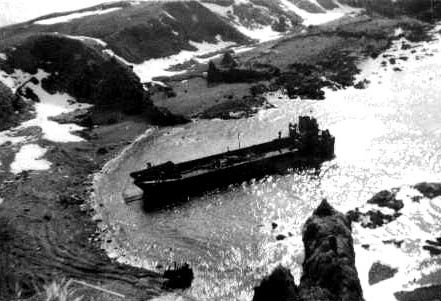 In all, the capture of Attu took 20 days to complete. In the final days of the battle, the Japanese killed their wounded with morphine and made one last bonsai charge through the American base camp. On their last charge, the Japanese went through the American hospital killing wounded soldiers and destroying the propane stove. Surrounded by units of engineers, the Japanese force committed suicide by holding grenades to themselves. At the end of the battle the Japanese had lost 2622 men and 28 surrendered. 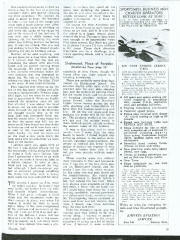 The Americans had lost 549 and had 1148 injured, many from the severe weather conditions on the island. The dead were buried in Little Falls cemetery at the base of Gilbert Ridge. 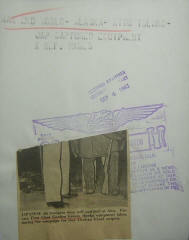 The bodies were later exhumed in 1946. The navy and army set up a large base on the island from 1945 to 1958, creating a little city at the edge of the world. There were hospitals, pubs, bowling halls, a church, and a movie theater. There were three working runways and several buildings. Now, all the buildings and two of the runways have begun to be taken over by the island. 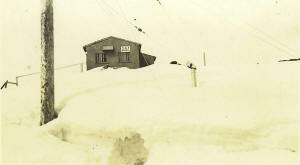 The only people remaining on Attu, reside at the USCG Loran Station. Twenty people in all; they serve one-year tours wandering through the skeletons of the past that lie rusting from the end of an era… at the edge of the world. THE CAPTURE OF ATTU, by Lt. Robert J. Mitchell. [The Japanese symbol on the ski] would be "migi," meaning "right." I'm guessing that if there is another ski it must have hidari/left on it.